So, you want to access IPv6 websites, but your ISP does not provide native IPv6 access? Well, here are some instructions for setting up a 6in4 IPv6 tunnel with Hurricane Electric! Now, these instructions are for RedHat based distro’s, and were specifically written using CentOS 6. This type of ipv6 tunnel won’t work behind NAT, so your machine must be connected directly to the internet with a public IP address (UPDATE: Thanks to KingKurly for pointing out that you can forward Protocol 41 to enable a tunnel through NAT, if your device supports it). If you are looking for something that will work behind NAT, an AYIYA tunnel from SixXS.net should work over NAT for you, and we’ll cover how to do this in a future article. 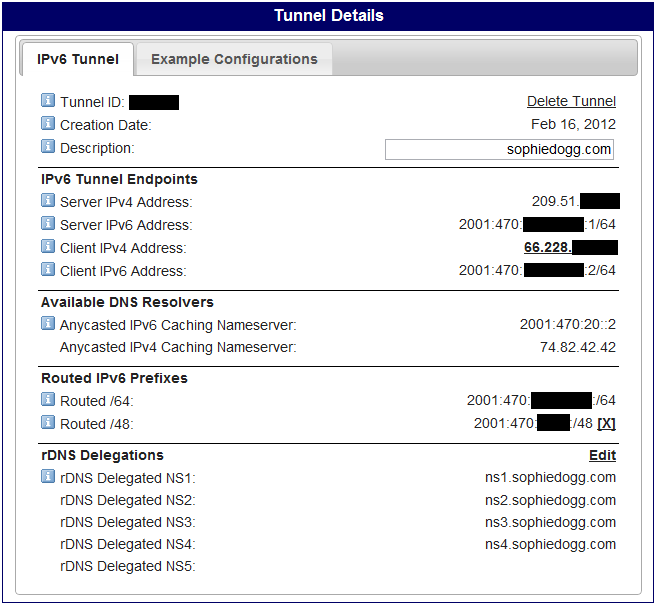 But, for now, let us continue with our 6in4 ipv6 tunnel from Hurricane Electric. First, go to Hurricane Electric and get your free tunnel. Next, open up ping requests from Hurricane Electric. This step is important, as they won’t allocate a tunnel if they can’t ping your machine. I normally don’t respond to ping requests, so I had to use a firewall rule like the one below to allow their pings through. The first rule accepts all ICMP traffic from 66.220.2.74, while the second accepts all ICMP traffic from everyone. Don’t forget to change the IP addresses at the top of the file to match yours! Make sure you change the IPv6 addresses to match what you have been given by Hurricane Electric! After restarting your network (with service network restart), you should be up and running! You can browse to an IPv6 website or try to ping an IPv6 address, to see if your IPv6 setup is working. Next, you can configure your forward and reverse DNS zones with the necessary records to show off your shiny new IPv6 addresses!